‘Ripper Street’, the period crime drama which was axed by the BBC last year, will be returning for a third series on Amazon’s video-on-demand service. Amazon has confirmed that filming for the third series will begin in May and will air first on Amazon's Prime Instant Video, exclusive to subscribers, and then a few months later on BBC1. The Prime Instant Video service -formerly LoveFilm - struck a deal to revive the series with ‘Ripper Street’ producer Tiger Aspect after the drama failed to bring in expected audience numbers last year. ‘Ripper Street’ is a co-production between Ireland’s Element Pictures and the UK’s Tiger Aspect Productions and Lookout Point with funding from BBC, BBC Worldwide and the Irish Film Board, who proved crucial in securing permission for ‘Ripper Street’ to shoot in Ireland for a third year. Dublin-shot ‘Ripper Street’, which is set in Victorian-era London, stars Matthew Macfadyen as Detective Inspector Edmund Reid, Jerome Flynn as Detective Sergeant Bennet Drake, Adam Rothenberg as Capt. Homer Jackson and Irish actor Damien Molony as Detective Constable Albert Flight. Further Irish members of the cast and crew to work on ‘Ripper Street’ to date are Monaghan actress Charlene McKenna (Raw, Jump); producer Ed Guiney; make-up artists Sharon Doyle and Eileen Buggy (2013 IFTA winners); production designer Mark Geraghty; costume designer Lorna Marie Mugan; and editor Una Ní Dhonghaile. It is a series of one-hour thrillers that transport audiences into the dark heart of London as it stumbles toward the Twentieth Century. BBC controller of drama commissioning Ben Stephenson said: "This is an exceptional opportunity to bring back ‘Ripper Street’ for a third series by working with a great partner." Jason Ropell, head of Amazon Instant Video international content acquisition, said: "We're delighted to have secured not only the highly popular first two seasons of ‘Ripper Street’ for our Prime Instant Video customers but we can also confirm today that we will be making season three, news that we know will delight the millions of fans of this brilliant British drama." The deal, which was first reported in December, marks a significant moment for the UK TV industry as this is the first time a VoD operator has stepped in to fund a drama series after it was dropped by a major broadcaster. Element Pictures’ Andrew Lowe said “We are delighted to welcome back our partners Tiger Aspect and Lookout Point and writer Richard Warlow for a third season of the brilliant ‘Ripper Street’. 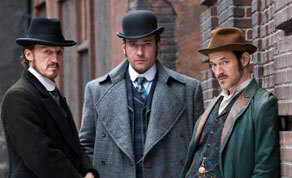 We look forward to helping them realize this next chapter in the ‘Ripper Street’ story. Filming will begin in May and the production will be based in Clancy Barracks in Dublin for several months. The first and second series of ‘Ripper Street’ employed 5,000 Irish cast, extras and crew, providing approximately 170,000 Irish work hours per series. The series is expected to provide a major boost to the Irish film and television industry as the total value of the first and second series of ‘Ripper Street’ to the Irish economy to date has been approximately €20 million, in terms of spend on local goods and services.